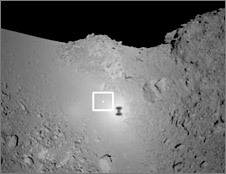 A target marker, a device that acts like a lighthouse, was released from Hayabusa when the spacecraft approached the asteroid Itokawa. The marker was about 10 cm in diameter, and was covered with a reflective coating. The coating was illuminated by a flash of light emitted from Hayabusa, so that the marker could guide the spacecraft's descent onto Itokawa. Prior to launch, JAXA ran a worldwide campaign called “Let's Fly to Meet Your 'Star Prince,' ” which offered supporters a chance to have their name engraved on Hayabusa's target marker. On November 20, 2005, Hayabusa successfully released the marker, which contained 880,000 names from 149 countries around the world. Q. How did you come up with the idea of a target marker? 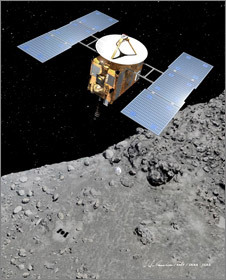 Hayabusa needed to approach the asteroid's surface very slowly to ensure a safe landing. The spacecraft has an autonomous navigation system, and vertical landing would be relatively easy, since the distance to the surface is measurable with an altimeter. However, a major challenge was measuring the speed of Hayabusa moving horizontally. And then we came up with the idea of guiding Hayabusa by dropping a kind of lighthouse at its landing point. The target marker would be illuminated by a flash beam from Hayabusa, and the spacecraft would be able to navigate its descent by determining its location relative to the marker. The next problem was Itokawa's extremely low gravity. On Earth, an object falls when it's dropped because of gravity. But on an asteroid like Itokawa, the object bounces back, as the asteroid's gravitational pull is too weak to pull it down. We had to find a way to prevent the target marker from bouncing off the asteroid's surface and flying away into space, so we invented a way to make the marker stop and stay in place where it was dropped on the surface. We had discussed a number of solutions, such as using a resin plate with low elasticity, or spray painting Itokawa's surface to define a landing point. But in the end we decided to adopt a method inspired by a traditional Japanese toy, a bean bag (otedama). The bean bag contains hundreds of beans, whose energy is scattered and lost when they collide with each other inside the bag. This lessens the kinetic energy of the bean bag, which is why it doesn't bounce when dropped on the floor. To get the same effect, we filled the target marker with beads of polyimide resin. Q. What was the greatest challenge in developing the target marker for Hayabusa? We ran into unexpected problems while running zero-gravity experiments on the ground, and we realized that we knew a zero gravity environment only theoretically and hadn't quite grasped its true nature. 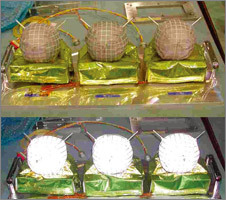 The target markers onboard Hayabusa now are hard balls made of aluminum, but initially we were experimenting with markers made of cloth and shaped like a potato. When this type of marker was dropped in normal gravity, the bag would take the shape of the surface on which it was dropped. However, in a zero gravity environment, we found that the bag bounced in the shape it took on when it was dropped. The irregular shape of the bag didn't allow the beads to move around freely inside, and therefore there was no energy redistribution. 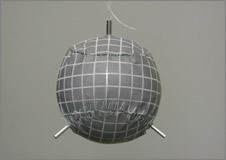 So we altered the material from cloth to thin aluminum, to prevent the ball-shaped target marker from changing its shape. Also, the quantity of beads was important; it couldn't be too many or too few. If there are too many, the beads can't move around. But when there are too few, energy redistribution does not take place, because the beads don't collide with each other sufficiently. In either case, the target marker wouldn't stop dead. So after running dozens of zero-gravity experiments to find the right number of beads, we settled on about 300 grams for the weight of the Hayabusa target marker. Metal plates, sand, and stones were used in drop tests, and we finally came up with a target marker that would stop dead no matter what type of material it was dropped on. Q. What is your most vivid memory of the Hayabusa operations thus far? Hayabusa's touchdown on the asteroid might have left many people with the strongest impression, but for me the most memorable moment was its launch, when we sent it off into space. 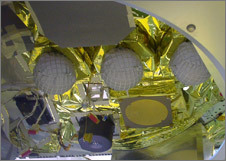 A probe that we spent many years developing and testing on the ground was launched into space to begin its mission. It was the moment when Hayabusa, to which I had devoted a certain chapter of my life, took off alone into space for the first time. It was also a great joy to learn from Hayabusa after launch that it was doing well, through telemetry data. Q. How did you feel when the target marker that contained the signatures of 880,000 people was successfully deployed? People contributed their names and their wishes for Hayabusa's success, so I really wanted to make sure that the spacecraft would reach the asteroid. When the target marker was successfully deployed, I was rather relieved at having accomplished my task. But I was quite moved when I was able to confirm the target marker illuminating Itokawa in an image taken later. Q. What are your dreams now? Although Hayabusa's mission to return asteroid samples was the world's first attempt, this area will continue to advance, so I would say that we are still in the middle of an upward slope. With the experiences I've earned through the Hayabusa project, I'd like to explore more celestial bodies. More specifically, I'm very interested in developing spacecraft, whether manned or unmanned, as my specialty is space systems engineering. Assuming that space planes will be used for manned space flights, I'd like to contribute to progress in engine research and development. Q. What do you think about Hayabusa's heading back to Earth? Hayabusa's return to Earth has been delayed from 2007 to 2010. I am very concerned about this, and I'd very much like Hayabusa to come back safely. Q. What are the messages you would like to deliver to children who wish to be involved in future space development? Watching the launch of a space shuttle on TV as a child, I aspired to make such spacecraft. I also hoped that someday ordinary people would be able to casually go into space and come back. I think that I have come close to fulfilling my dream with Hayabusa, even though it is not a manned rocket. I do hope that children have dreams. Mine happened to be space, but it doesn't matter what your dream is about. Children should have dreams and the opportunity to live up to them. Doctor of Engineering. Associate Professor in the Research Division for Space Systems Engineering at the Institute of Space and Astronautical Science (ISAS)/JAXA. Dr. Sawai graduated in 1994 from the Department of Aeronautics and Astronautics at the University of Tokyo, and became an assistant professor at ISAS. He has been in his current position since 2003. Dr. Sawai specializes in control engineering.